Following our signing of Odion Ighalo as our MultiChoice ambassador, we have launched a brand new campaign for our DStv Compact bouquet just in time for the upcoming premier league season. The ‘Live Your Dream’ campaign is what it is called. Please see attached official release and first photo of the campaign. I have also included some BTS shots for use online. Kindly help us use on your most esteemed media platform. 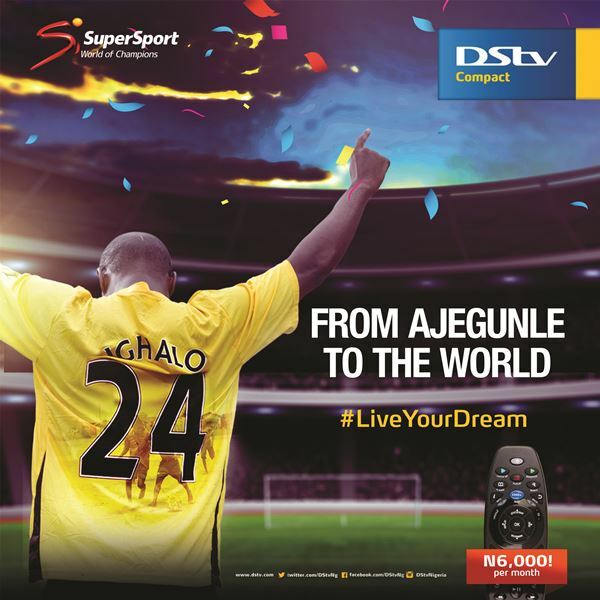 Lagos, Nigeria; 22 July 2016: MultiChoice Nigeria has unveiled a brand new campaign for the DStv Compact bouquet called Live Your Dream and it features its latest brand ambassador, Odion Jude Ighalo. The Live Your Dream campaign celebrates the passion, perseverance and determination of Nigerians to achieve their dreams against all odds with Ighalo’s story as a perfect backdrop. The campaign uses Nigeria’s most loved sport and one of Africa’s finest football exports to tell a story of hope and victory. According to the General Manager, Marketing, MultiChoice, Martin Mabutho “Ighalo’s journey to football stardom has been a source of inspiration for many. His passion and performance in the game have made him well respected both home and abroad. As a brand, we are going down memory lane with Ighalo and will discover how he was able to live his dream from the streets of Ajegunle to the tables of the Premier League”, he said. The full-fledged campaign that includes TV, Out-of-home, digital, radio and press adverts has officially been launched as a build up to the upcoming 2016/17 Premier League season. “Subscribers on DStv Compact will have a chance to live their dream as well by watching all the Premier League games on the Compact bouquet for only N6,000”, said Mabutho while highlighting the benefits of the campaign to subscribers. Speaking further, Mabutho said “In the past couple of months we have revamped our Compact package; offering our subscribers more value. We recently added two new SuperSport channels SuperSport 11 (DStv channel 231) and SuperSport 12 (DStv channel 232) dedicated to showcasing the Premier League and La Liga respectively, as well as the broadcast of the recently concluded Euro 2016 matches at no extra cost. We believe that Ighalo’s endorsement will consolidate the expansion of our football offering on Compact while also heightening expectation of the upcoming Premier League season”, he said. DStv Compact features some of the most exciting channels and programmes at a monthly subscription of N6,000. What’s more, DStv’s video on demand service, Catch Up, is now available to Compact subscribers with an active Explora and PVR subscription, offering them so much more great content.